What follows was inspired as much by purely selfish reasons as it was intended to serve your edification. 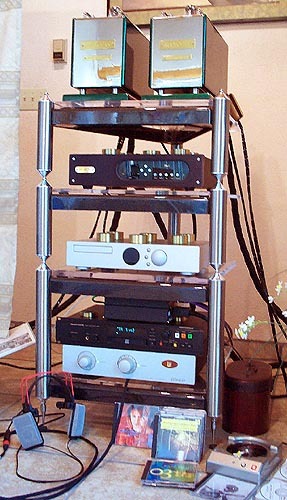 You see, during the review of the Birdland Audio Odeon-Ag, I felt inspired to investigate its Toslink interface. Why? Because this brand-new reference DAC allots two of its four inputs to this allegedly fatally flawed interface. Perusing designer Gilles Gameiro's website, I noted that in his personal reference system, he tosses the link to the Odeon himself. This stopped me cold in my deeply entrenched, warm'n'fuzzy tracks of Toslink slamming. If this optical connection was as inferior to RCA-carried S/PDIF as common consensus has it - why did Mr. Gameiro choose it for his personal reference system when he had a choice? What did he know that I didn't? To identify superior Toslink cable -- not something I had ever bothered with before -- a quick query on Audio Asylum generated three strong recommendations. Two of them I could procure: The WireWorld SuperNova III+ and -- compliments of the very supportive Robert Stein of The Cable Company -- Van Den Hul's Optocoupler. Inmates who owned either felt they were among the best of their kind. Hence the cards of today's poker session wouldn't be unfairly stacked, as could be concluded if some el-cheapo excuse for a proper Toslink got badly trashed by my resident Acoustic Zen "squared" or TARA Labs RSC. To push the envelope, audio gentleman Robert Stein included one AudioOne Reference Toslink. On the house side of the card table, he dropped off an Ensemble Digiflux. Then my site's wonderfully inspired graphic design mistress Nobuko got hip to this wired get-together. She FedEx'd over her personal NBS Signature-2-D, Siltech Golden Ridge and Cardas Lightning backup 75-ohm digital links. She also included a skinny black KimberKable Toslink in her digital care package before daring me to pronounce that one of my affordable Toslinks would dethrone or at least call to bluff one of her dear designer cables. Last but not least, Chris Sommovigo's new BNC/RCA i2digital X-60 cable sold not through his Stereovox dealers but on-line direct became available just in the nick of time. That slightly delayed publication of this survey's findings. However, considering that Chris -- with his original Illuminati cables -- created the now ubiquitous 75/110-ohm standard for digital interfaces meant that his newest affordable statement in this arena just had to be included. During the Birdland review -- and for a first toe-dip into these squirrely waters -- I somewhat more casually than dead-set had compared the Zen RCA to the WireWorld Toslink. At the time, I couldn't really latch onto any easily discernible differences. If angels were meant to dance on pointy needles for today's session, I reckoned that the highest-rez possible setup on my side was mandatory to do the job properly. My reference Cairn Fog V2.0 with 24/192 upsampler card omits RCA-carried S/PDIF for a single optical port. In my recent past, this connectivity issue alone would have precluded a purchase. Must have a proper single-ended digital out, yessir! Or so my brain-washed conditioning would have insisted. Thankfully for my ears and wallet, I now know better and the Cairn ain't going nowhere. But - for the purposes of this review, I had to employ my indefeatable Marantz CDR 630 recorder instead. It sports both necessary ports, RCA and Toslink. I used the Bel Canto DAC-2 as the push-button comparator between either. From there, the signal would flow through Analysis Plus Solo Crystal interconnects to the Unison Reseach Unico tube/Mosfet hybrid integrated and arrive within an inch of my ears via the custom Stefan AudioArt cable and AKG K-1000 headphones. Hi-rez and convenient? Definitely the lazy man's guide to enlightenment in this scenario. One could certainly question the use of the Marantz as a state-of-the-art transport - but it's what I had on hand so no argument from me on that count. If things were gonna get hairy -- hair's width differences impossible to tell apart when dealing with room acoustics and added complexities -- I felt as prepared as a deaf but conceited reviewer could be. Today's survey makes zero pretensions at being conclusive. I merely wanted to test -- from a limited sampling within a single system context -- how much, if any, sonic headway S/PDIF-RCA may still brag about over S/PDIF-optical. 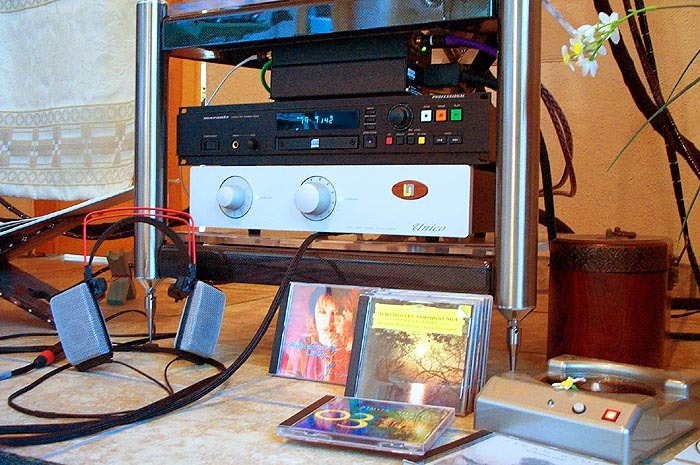 Put differently: If your player lacked RCA-S/PDIF but sported an optical digital jack, should you feel disenfranchised, disadvantaged and condemned to second-rate sound when going off-board? Here's some quick technical background as garnered from Kevin Halverson at Muse: Compared to analog RCA, Toslink fiber as a medium -- transmitter, cable, receiver -- is bandwidth-limited. 24/96 remains within its scope but 192 doesn't. Optical's lower ultrasonic headroom spells reduced native jitter rejection - 75/110-ohm RCA/XLR enjoys the clear advantage. On paper. Flip the coin to appreciate why perhaps only on paper. RCA runs the risk for ground potential riding atop the signal. Both chassis (transport and DAC) are electrically linked. Toslink's optical conversion eliminates this interference completely. Talking also with John Stronczer of Bel Canto, at least two respected digital engineers acknowledged that today's D/A chips, sample rate converters and phase-lock loops exhibit inherent jitter rejection far superior to what was possible just a few years ago. Hence RCA's touted jitter advantage should play out as less of a real boon. If a plastic or glass fiber optical link were properly engineered, one should indeed expect smaller rather than greater differences. Added variables of course remain: Cable connectors, dielectric absorption, conductor geometry and purity, impedance mismatches and concomitant internal reflections, noise rejection and cryogenic or proprietary wave treatments. Did I mention fairy dust and different levels of braiding skills? One last item before today's train leaves its station, on ramp 9¾ toward Hogwash where not all is as it seems. Cable comparisons are a drier business to conduct than sampling bad wine. They're even less fun to read. No usual tie-ins with music samples today that always serve the double purpose of introducing you to worthwhile software. For today, only condensed snap shots of individual comparisons between more different wires than I want to see again any time soon.